TOO MUCH SPICE? NOT ENOUGH? For those who are afraid of a little spice, have no fear the buffalo isn’t overpowering. You can also eliminate the cayenne to help reduce any spice. For those who want a weee bit more spice you can add more cayenne or even marinate the breasts in Frank’s Red Hot overnight to really saturate the chicken. 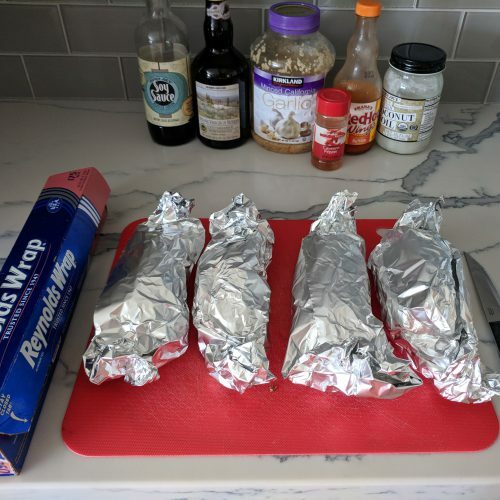 Costco occasionally sells a pre-marinated buffalo chicken for another option. This recipe is gluten-free, has 390 calories, 30g of protein, 11g of fat and 45g of carbs per serving. It is a little higher on the carbohydrate side because you are eating an entire sweet potato. 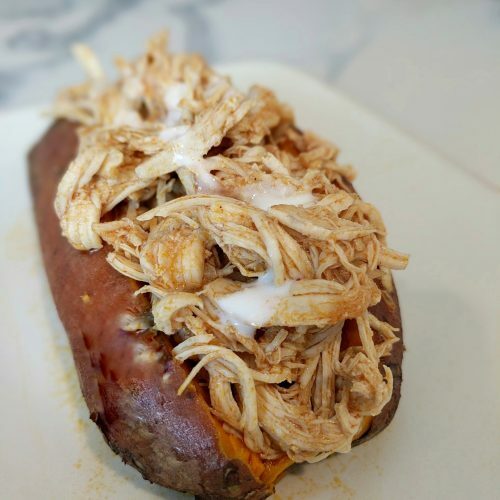 I based this recipe on an 8oz sweet potato and 5oz of meat. However you can tailor it to your personal diet. Add more meat, smaller potato, whatever works for you! 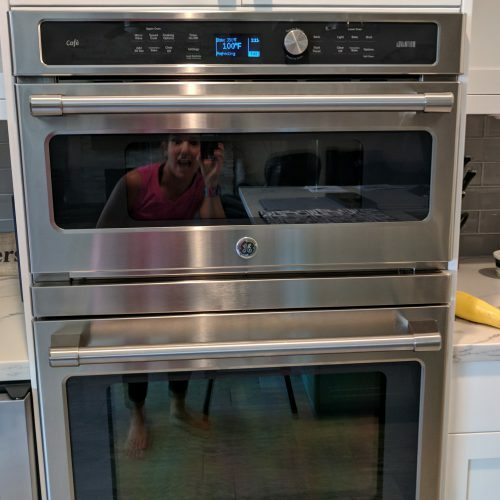 POTATOES IN OVEN OR POT? 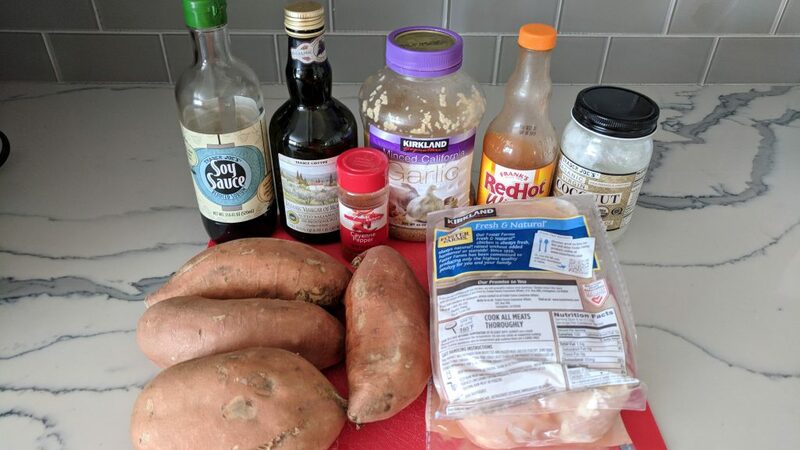 This time I utilized my tried and true way and cooked the sweet potatoes in the oven (click here for how to cook a sweet potato) however you could make the sweet potatoes in the instant pot as well by placing 1 cup of water, the steamer basket and 10-12oz potatoes in on high pressure for 18 minutes. Use a 10 minute natural release. Boom! 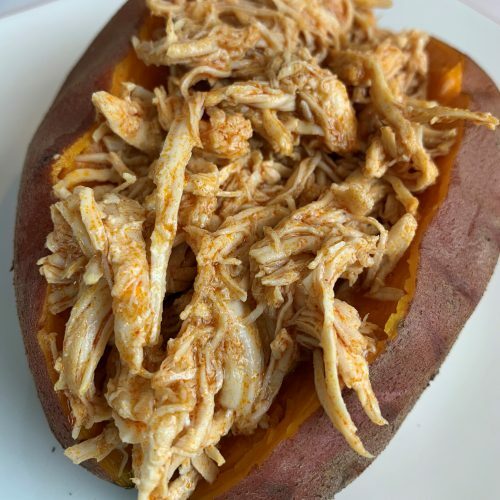 The chicken portion of this recipe only took 30 minutes in the Instant Pot however, you can also make this recipe in the crock-pot. 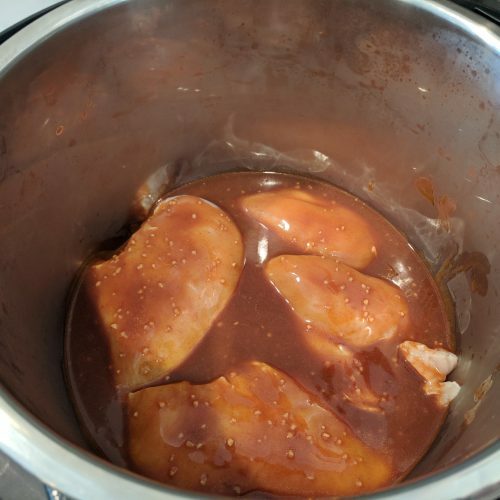 Just follow the recipe below and instead of putting the chicken and sauce in the instant pot, throw it in the crock-pot and set it on low for approximately 6-8hrs/high 3-4 hours or until the chicken is tender enough to shred. 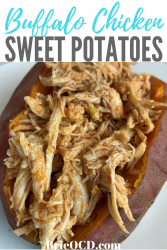 Whether you cook this recipe in the Instant Pot or Crock-pot, I promise, you will be satisfied! 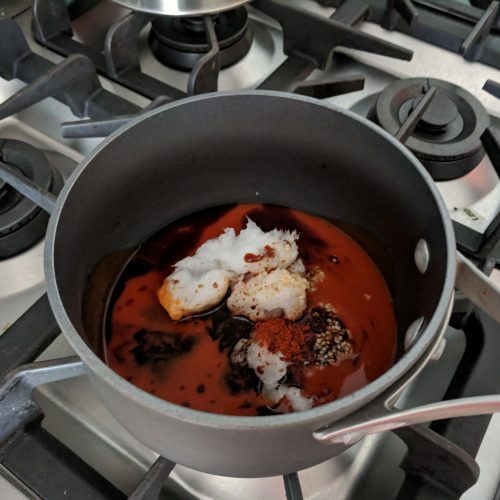 while potatoes are cooking, in a small pot, combine all the ingredients for the sauce. Over med heat, heat until the coconut oil is melted, about 4 minutes. 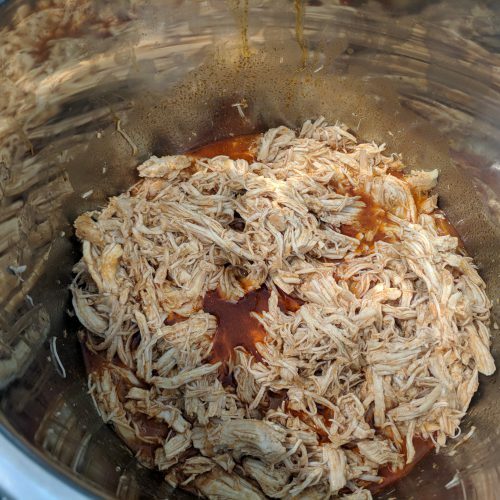 place raw chicken in the instant pot. cover with the sauce. 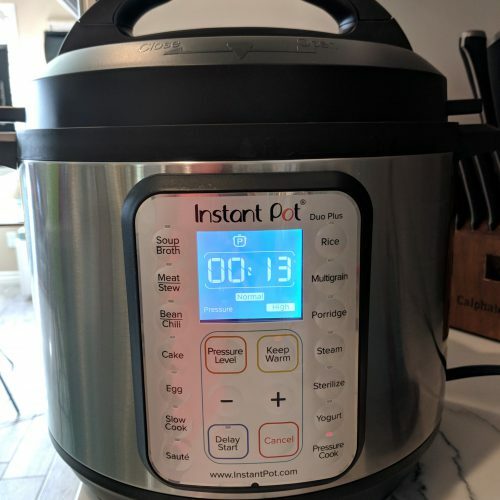 set instant pot for pressure cooker on high for 13 minutes. use quick release method (press cancel and release steam). 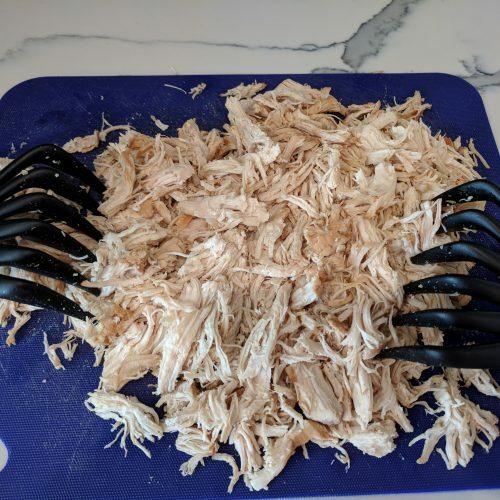 take chicken out of instant pot and shred with shredding claws or two forks. 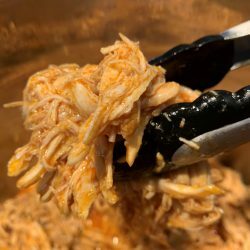 put chicken back in instant pot and stir with juices. keep on warm until potatoes are done. slice potato down middle, season to taste with ground black pepper. top with chicken and drizzle with ranch or blue cheese. Enjoy!